MILAN (AP) — A black player for Italy’s most popular soccer club won support from other European players Wednesday, a day after he was subjected to a torrent of racist abuse from an opposing team’s fans. Juventus forward Moise Kean scored his team’s second goal against Cagliari late in the 2-0 victory Tuesday and stood in front of the home fans with his arms outstretched. That seemed to trigger a furious and openly racist outcry from the fans. 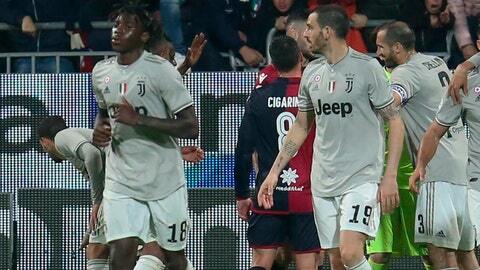 One of his teammates, Leonardo Bonucci, added fuel to the fire by saying Kean was partly to blame for the angry response. That prompted players on other teams to rush to Kean’s defense. Manchester City winger Raheem Sterling, who is black, ridiculed the remark: “Leonardo Bonucci … All you can do now is laugh.” He also posted a screenshot on Twitter. Kean, a 19-year-old Italian whose parents are from Ivory Coast, was insulted by home fans during much of Tuesday’s game in Cagliari. He received a yellow card for faking an injury in the first half. His goal and ensuing celebration seemed to push the home fans over the edge. Cagliari captain Luca Ceppitelli tried to protect Kean, rushing to his side and pleading with the fans to stop. Instead, Ceppitelli was almost hit on the head by a bottle thrown from the stands. Matuidi, who is also black and won the World Cup with France last year, was subjected to racist abuse in Cagliari last year. The incident involving Kean is but the latest example of racism in soccer this season. Last week, several England players were targeted with monkey chants during the team’s 5-1 victory in Montenegro. Former Manchester City midfielder Yaya Toure, a four-time African player of the year from Ivory Coast, said players who are being targeted should walk off the field. As criticism mounted Wednesday, Bonucci backtracked on his comments in an Instagram post. Kean, who scored in both of Italy’s qualifying matches for the 2020 European Championship, also won backing from Mario Balotelli — another black Italian born to African parents and who played for the country’s national team. Kean hasn’t spoken publicly about the incident, but posted a photo of his goal celebration on Instagram.